For many years, Melissa Hurst didn’t realize she had a Red Cross story. Then she discovered the truth. “The Red Cross really had been woven in and out of my life starting at a very early age,” she says. The swim lessons she took as a child, at her local community pool in Kentucky, were orchestrated by the Red Cross, and her mother spent her own youth “literally living at the pool because she was a lifeguard,” Hurst explains. “She had been trained by the Red Cross.” In high school, Hurst was part of student government and helped plan the school’s Red Cross blood drive. It was a family tradition she was carrying on without making the link: 30 years earlier, her great aunt set up the first monthly Red Cross blood drive at the community church. While working as an employment lawyer in private practice, Hurst says she had always envisioned taking her practice in-house someday. After spotting a job posting for an employment attorney with the Red Cross in an issue of Legal Times, she realized it was exactly the opportunity she had been looking for. “It was what I had gone to law school to do, and to be able to do it in support of a humanitarian mission—versus a company that may be looking to increase profit share or produce more of something—was really enticing,” Hurst says. 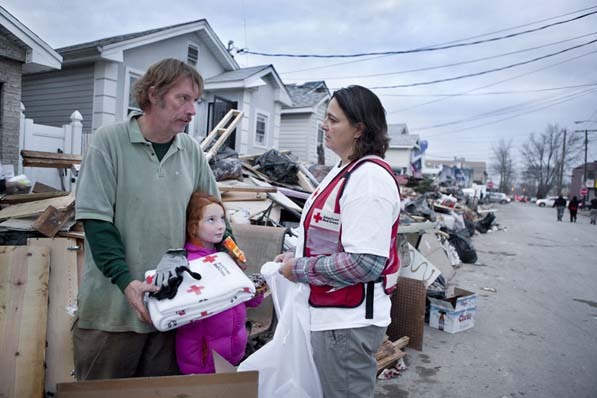 Frank McDaniel and his seven-year-old daughter, Isabel, receive a “Sandy Kit” from Red Cross volunteer Marcella Baum. McDaniel owned several Staten Island, New York, homes, which he leased to tenants. “All they own now is the clothing on their backs‚” he says. 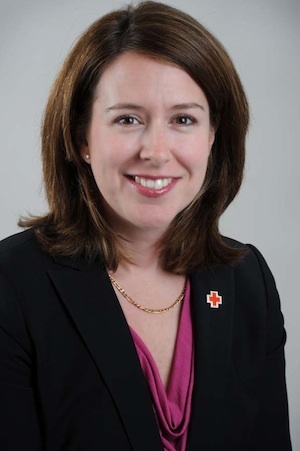 Today, Hurst has found the perfect job, as senior vice president and chief human resources officer at the Red Cross. “What I find so enriching is that the Red Cross provides opportunities that let you be what you want to be professionally, but you can do it for an organization that has an important altruistic mission,” says Hurst, noting that she enjoys watching all of the rewarding careers at the Red Cross, many that aren’t commonly associated with a nonprofit organization—professions such as finance, legal, and marketing. Ensuring robust career development opportunities and strong employee engagement across an organization that’s active on both the local and national level can sometimes be difficult. In the years since Hurst came to the Red Cross, the organization has evolved tremendously to meet the challenge. What was once a very compartmentalized structure has become much more fluid and unfettered. “We had a corporate function here in DC, and then we had operating units out there that were very autonomous,” Hurst explains. The organization launched efforts to break down those silos. “I think the opportunities are even greater today for people to come in and look at the Red Cross holistically across the nation as an employer,” Hurst adds. The initiative to bring the organization together, called One Red Cross, aims at building a unified employee culture, and hinges on the idea that everyone is working toward the same goals. “It’s thinking about what we want to achieve across the globe, what we want to accomplish nationally, and what the piece looks like in each of our communities,” Hurst says. 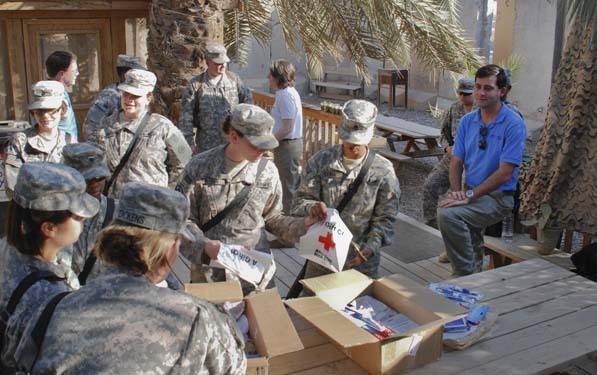 The impact of the Red Cross stretches all the way to places like Baghdad, Iraq, where female soldiers receive packets of hygiene items. Burnout can strike anywhere, and for those tireless people who keep the Red Cross going, there’s rarely a break in the action. “I’m constantly amazed,” Hurst says. “Throughout my entire career at the Red Cross, there’s definitely one key characteristic that I see in our employees as well as our volunteers, and that is selflessness.” Everyone involved with the organization seems to get reinvigorated each time there’s a disaster, but it can eventually take a toll if people aren’t vigilant and self-aware. “We constantly monitor our employees and volunteers to ensure they’re taking care of themselves as well,” Hurst says. The HR team convenes for each disaster to evaluate the employee-support programs and policies that are in place, and to make changes when necessary. This practice becomes especially important when the Red Cross workers responding to a disaster are also being impacted by it, as was the case during many widespread events. When Hurricane Sandy struck the East Coast, for example, Hurst says, “We looked at our leave program, and extended or modified it so people had time off that might not otherwise have been available to them.” Her team also brought in resources through the employee-support program to help Sandy responders deal with exhaustion and their feelings of devastation. Mixing things up a bit and providing people with fresh opportunities also helps to keep folks engaged. “We’re looking at doing different assignments for people, to let them use another part of their brain or another skill set,” Hurst says. The organization-wide focus on talent management makes these opportunities available, and not only offers workers the chance to expand their understanding of all the roles the Red Cross plays, but also gives them time to get out of crisis mode. “That way, they can truly recharge the part of the battery that responds to these disasters, focus on something that’s a little bit different, and gain new experiences and skills,” Hurst says.